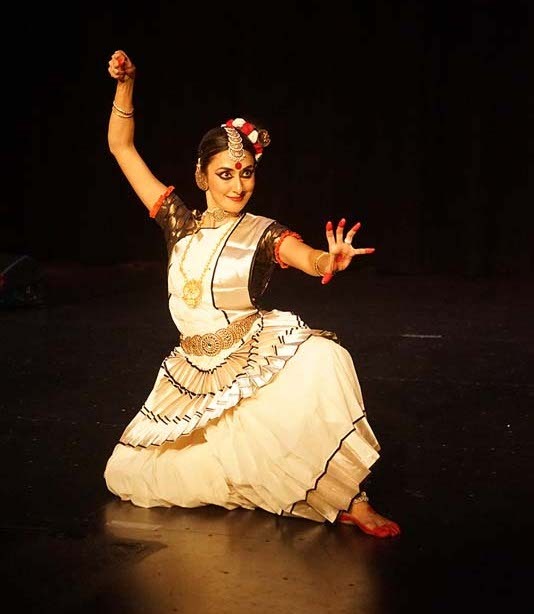 Eloquent and intense facial expressions with graceful and flowing movements that evokes rasa-anubhuti (aesthetic experience) are characteristics of Bindu Rajendren’s Mohiniattam performances. As a performing artist Bindu’s strength is in her abhinaya (art of expression) and her intense story telling abilities. At the centre of Bindu’s dance practices is the elemental spiritual connection through Bhava (Sentiment) and Bhakti (Devotion). Indian mythology, spirituality and dance are intertwined. God Shiva – the cosmic ecstatic dancer – is depicted in Mayurbhanj Chhau tribal martial art dance style. Mohini, the divine temptress dances Mohiniattam personifying the embodiment of feminine beauty, love and allure. Become immersed in the enchanting nuances of Mohiniattam dance – the dance of Mohini, the divine enchantress. It is a lyrical dance style from Kerala, South Indian, where movements are delicate, flowing and feminine – like swaying palms.